The MHGS AviTools™ provide an easy and effective way to build AVIs (Video Clips) under MS Windows. With AviRec.exe you can capture AVI movies from your screen. 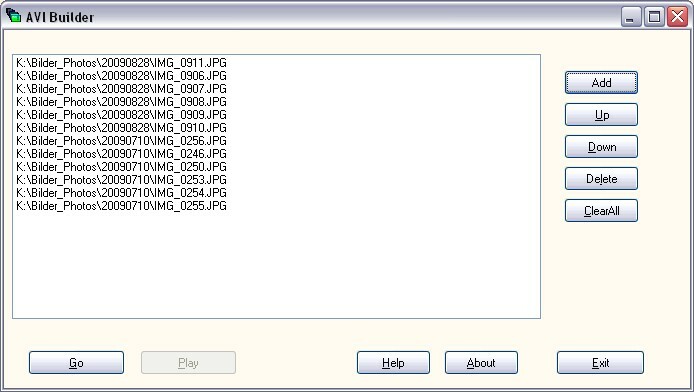 AviBldr.exe lets you compose AVIs from bitmaps, JPEG images, or other graphic files. For developers: MHGSavis.dll provides a DLL API and an Automation/COM interface that allows you to use the features in your own applications and scripts. Please contact us for obtaining the documentation. 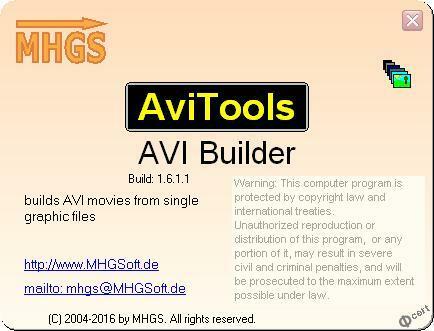 The MHGS AviTools are Freeware for private use. If you want to use them commercially please contact us for an offer. No warranty. Read the LEGAL DISCLAIMER. You can download the zipped MSI here. Version 1.6.2, 1.3 MB, MD5=C5B7821002D2CF52777D65458B18966A. The MSI file uses the Microsoft installer engine to install the MHGS AviTools on your computer. Read the included install.txt for details on installation issues. The AVI recorder provides an easy way to record AVIs from the screen. Whole Screen will record anything on the screen of your primary monitor. Window lets you choose a window on your desktop. Rectangle allows you to draw a rectangle on your desktop that will define the recording region. Simply move the mouse cursor to one corner of the desired rectangle, press the left mouse button and drag the mouse to the opposite corner of the rectangle. Release the mouse button there. You can specify the frame time in milliseconds. The record time defines the time between two screen shots, while the play time specifies the time for displaying a single frame in the AVI. By choosing different values you can play the AVI with a slower or faster speed than it was recorded. The background color only makes sense if you selected a window as recording region and this window is resized later. In this case the background of the AVI frames will be filled with the background color. You must specify a destination filename, that is the location where the AVI will be saved. The current cursor will be shown in the AVI if the respective checkbox is checked. The compression option will decrease the resulting filesize significantly, however the image quality may get worse. The MHGS AviTool use a wide-spread codec. In singular systems creating or playing compressed movies might fail. Click on "Record" when you are ready for recording. As soon as you click on "Stop" or press ALT+ESC the recording will be terminated. You can now have a look at your new AVI by clicking on the "Play" button. You can create a single screenshot of the specified area or window by pressing CTRL+SPACE. This screenshot will be copied to your clipboard. 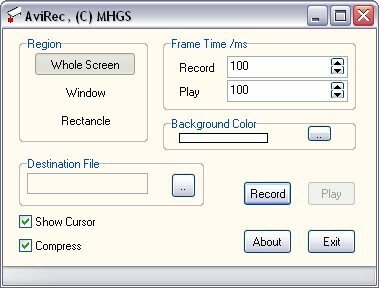 The "About"-button displays information about the MHGS AVI Recorder. With "Exit" you quit the application. Press F1 to invoke the Help (this file). If you want to record the content of a certain window the finder tool will help you to select this window. 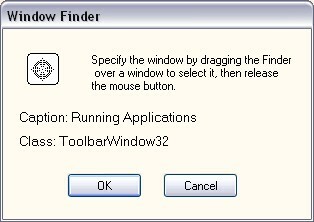 Drag the finder tool over the window you want to select. Then release the mouse button there. The classname and caption of the selected window are displayed. Click on OK to confirm your selection or on Cancel to cancel it. 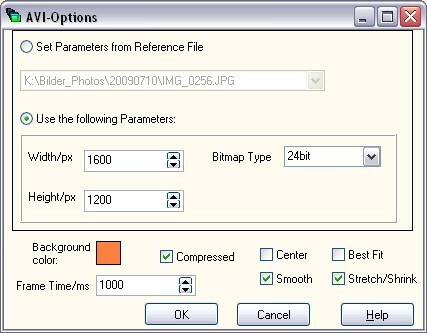 The AVI Builder creates AVIs out of bitmaps, JPEG images, or other graphical formats. For including DICOM images please contact us. Add all the images you want to include in your AVI to the listbox in the builder window. You can do this either by simply drag'n'droping the files to the Builder Window or by using the Add button and selecting the respective files in an open dialog. Use the Up and Down buttons to move the selected images for getting the desired order. With the Delete button you can remove single files from the list, while Clear All removes all the files. The Help button or preesing the F1 key will invoke the Help (this file). Clicking on About displays the About Dialog. After you have laid down the order of the files to include, click on Go. You will be asked for the destination AVI file. Choose a filename and click on OK. The Options Window now gives you opportunity to choose different options. After having created the AVI file you can use the Play button to display the AVI in your AVI viewer. The Options Window appears after choosing a filename for the AVI. or specify width, height and pixelformat of the AVI manually. Smooth images that will be stretched. Not all these options can be combined. Clicking on OK will create the AVI file now. Cancel aborts the operation. With F1 or the Help button you can call the Help (this file). The About Dialog gives you information on the MHGS AviTools and provides links to our internet page https://www.MHGSoft.de and eMail address mhgs@MHGSoft.de. The MHGS AviTools are one of our award-winning software products.